This article is not a personal opinion or a conclusion about what’s happening in Egypt. This article states facts and documented evidences. What Egypt is dealing with, since Muslim Brotherhood reached power, is a pure evil and terrorism against the whole Egyptian community. I dedicate this article to all the people in the whole world and to whom it may concern, not to see facts with Egyptians eyes, but to see facts as they happened and still happening in Egypt. I also dedicate the second part of this article to all Foreign Medias who deliberately published lies and faked news in the whole world, which was only serving the Muslim Brotherhood terror war against Egyptians. 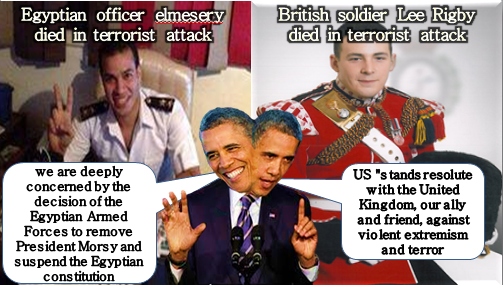 I’m doing the foreign Medias Homework, in publishing facts about what is really happening in Egypt. Publishing lies and fake news by foreign Medias caused Egypt’s great loss of many innocent Egyptians souls and blood shedding, committed by The Ex-Brotherhood Regime. That Ex-Regime is still supported by your governments and their terror acts against all Egyptians are under the sponsorship of your Presidents and their administrations. 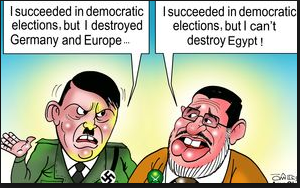 I can understand why the US, EU and Scandinavian governments are supporting terrorists in Egypt and still defending Ex Brotherhood Fascism religious regime; But what I don’t understand is the total absence of Foreign Medias Ethics in relation to what was happening in Egypt and still happening! I’m not a professional journalist, I’m an Egyptian blogger and a mother who are trying hard to save all Egyptian children from getting massacred by Muslim Brotherhood. I’m just spreading the word, hoping to find anyone out there, who have the willing of just listening to our SOS messages, since brotherhood reached power in Egypt. For those who know nothing about history, Egypt have saved the whole entire world from the Inhumane Brutal Mongols and Tartars Terror Invasion in 1260. And Egypt is saving the World once again from the same Inhumane Brutal terror of The International Muslim Brotherhood Organization in 2013 against all humanity as the following video will show. There is no difference between Al-Qaeda Organization of Bin Laden and The Muslim Brotherhood International Organization of Mohammed Morsi Ex-President of Egypt. Brotherhood International Organization is the Uterus who gave birth to Al-Qaeda and Extremists Islamist groups in the whole entire world. I’m not writing my own opinion or speculations here as I mentioned before. I’m not even going to ask you to read what has history told about Muslim Brother International Organization. I’m asking all of you who have any doubts about the Brotherhood organization, to read their own books and their own Commandments addressed to all their members and followers. The following video is subtitled in English – Rabaa Square – Morsi’s supporters – I’m not going to have any comment on that video – Brotherhood supporters serious threat against Christians – civilians – Military and Police – and that’s exactly what they did after the 30th of June 2013. The following video is subtitled in English: Egypt is saving the world from terrorism. The video is 9:49 Minutes long. Please start to watch that video at the 1:18 minute and not from the start to avoid the short introduction by an Egyptian Host, who had the exclusivity of publishing that video. The second part as I mentioned above, is dedicated to all Foreign Medias and to whom it may concern. Videos Evidence of some of the Egyptians tortured victims who are still alive. Victims who got brutally tortured with no mercy and for no reason, but pure evil terror committed against them by Muslim Brotherhood and their supporters in Rabaa and Nahda squares, where they were having their Sit-In. There are many videos than those following ones, The ones here in that article are not the only ones. Perhaps, the foreign medias, will decide one day soon, to do some searching or interview the victims who are still alive. The following videos show the torture marks on their bodies, their testimonies about what happened to them, and what they have eye witnessed and how they managed to escape or rescued. What you gonna hear in those videos from the eye witnesses, the least thing I can describe it with, is Pure terror Evil, which you can only watch in the American horror movies! Foreign Medias never interviewed those victims or their families! I wonder why?! But the Foreign Medias took whatever the Brotherhood and their supporters were telling them as a word and evidences of Honor. Foreign Medias Never even bother to check a single case of innocent civilians, police and military individuals, who got massacred right down Rabaa and Nahda Stages and also all over the country. The Brotherhood were claiming on their Sit-In stages that they are against and condemn all kinds of Violence, while under their Sit-In stages, they were practicing all kinds of torture and killing against their victims! I’m just going to post some videos here as Evidences, so please bear it with me. There are many evidences, I can’t add all of them in that article, so you don’t get bored to death, as I know many of you do….I picked just four of them, to give you an idea about the pure terror evil those victims and other victims have been through. A 10 years old kid! 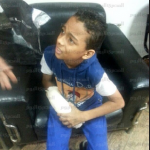 He said:” My name is Mostafa Ahmed Mohammed, I’m 10 years old, I was carrying the minister of defense picture, playing and chanting with my friends in the International Garden which is not far from Rabaa square in Nasr city. Brotherhood supporters attacked me and my friends. They came to us and told us to give them those pictures of Al-Sisi, and when my friends and I refused to gave them the pictures, they started to slap us on our faces, my friends ran and manged to escape, but I couldn’t. I don’t know what happened. All of a sudden, the image just fell down from my hand and I saw my hand full of Blood. The father of The child added:” Why have they done that to my 10 years old child? He was just playing in the Garden with his friends and we raise our kids on loving and feeling proud of their Military, Military protect us and protect our country, we raise our kids on those principles. My son is a child he has nothing to do with demonstrations or being with or against whoever? 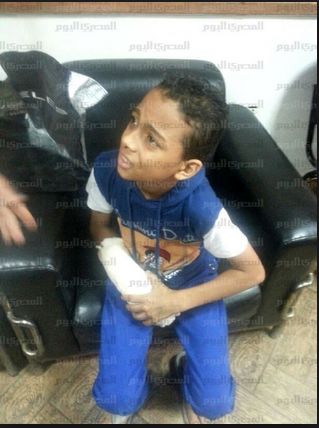 He is just a child and was celebrating the feast and was carrying Al-Sisi’s picture.” Is that a crime? The following screenshot: The name of the victim is Ahmed Fatouh, one of the tortured victims by MB in Rabaa square. The screenshot shows what kind of injuries and wounds he had. Brotherhood supporters have broken every single bone in his body. He was found thrown on the ground, in the street behind Rabaa’s mosque. Some people found him in the street and called the ambulance, which took him to the Nasr City Hospital. 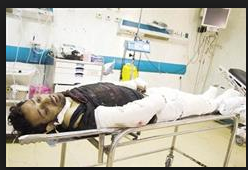 The victim said: The brotherhood supporters in Rabaa did that to me. They tortured me and I don’t know why they did that to me. 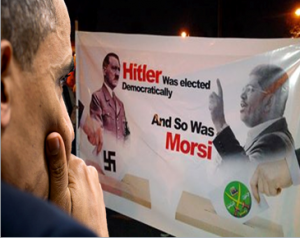 I told them that I support Mohamed Morsi, but they did not believe me. I even told them that I was carrying Morsi’s picture because I support him but they did not believe me and they started to torture me. It was very hard to take more details from the victim because as the Hospital reports mentioned and the ambulance emergency team confirmed, the victim reached the hospital and nothing was in one piece in his body, except his clothes! Video : The victim said I’m a poor guy, I was in Rabaa square and I went there to eat and sleep and use their facilities like toilets, because I heard that there in the square, you can go and have money, food and a place to sleep. He said:”What happened is that after I spent six days in the square, I was forced to wake up one day by some of the Brotherhood supporters who were accusing me of theft. I told them search me, I have nothing except the Clothes I’m wearing. They said where are the tools you have stolen from that shelf over there? I told them that yesterday night, I saw a guy wearing a cap on his head and I described the guy to them – That guy came and took the tools, but I did n’t take or steal anything. All of a sudden, I saw about 30 Brotherhood supporters surrounding me and they dragged me in a room under the Rabaa’s stage. The room was closed with a lock. I heard one of them telling the others, go and ask Doctor Khaled to come and open the room. When that Doctor came, they started to torture me with all kinds of torturing tools. They shaved my head and I can not describe all of the torturing tools – see how my face and my body look like and you will be able to tell what kind of torturing they were practicing against me. The torturing lasted from the morning till late evening. I was fainting all the time from the torturing and beatings. Then I saw a religious Sheikh (those who are supposed to be Theologians). When that theologian came, he asked them what has he done? They told him that I’m a thief and they didn’t find anything with me and that I don’t want to confess the theft. The theologian told them, after all what you have done to him, and he still hasn’t confess, then release him because if he was a thief, he would have confessed after all that torturing! Then before leaving, the theologian told them, before you release him, cut one of his hands fingers, so he will never forget who we are! After they cut one of my fingers, couple of them, dragged me out and put me in a car and I don’t know where they were taking me. Then they stopped and I understood that they had a flat tire. When they were trying to replace the flat tire, I saw a police car stopped in front of us. The policemen were asking them what’s going on – They got nervous and they told eh policemen that they arrested me because I’m a thief and they were taking me to the next police station. The police checked them and checked the car and found weapons in the car and took us all to the police station. I told the police what happened and here I am, after I have put my official statement for all what they have done to me. Video: Victim’s name, Ibrahim 28 years old. Ibrahim said:” I have nothing to do with politics and I have never participated in any demonstrations. At that day, I had some of my relatives with me, we finished our prayers in one of the mosques near Al-Nahda Square, because I live close to that area. On our way out from the mosque, we heard sounds of shooting and people around us started to scream and run. We didn’t know what was going on, and we were in a big shock that made us freeze where we were standing. Then we saw the Brotherhood supporters demonstration attacking us with weapons and shooting randomly at everyone in our direction. We started running to escape in one of the side streets, I got a gun shot in my leg and I fell down. Many of Brotherhood supporters were surrounding me and one of them who carried a gun, pointed it to my head, and told me are you with or against Brotherhood regime? I told him I’m not with nor against any one. So, the guy who was holding the gun and the other demonstrations started to drag me and they were hitting me with iron and wooden sticks on my wound and everywhere in my body and they were telling each other, let’s break every single bone in his body. When they were beating me, I knew that I was going to die and I think I fainted, because I don’t remember how I got rescued because when I woke up, I found my self in the hospital. My relatives who were with me, they ran like I did in different directions and no one was able to rescue me because every body was running and screaming in great panic and terror from what happened to us. My relatives told me when I was in the hospital, that when my father was told about what happened to me, he ran to where the Brotherhood were torturing me and he begged them as a father to let me go, and he covered me with his entire body to protect me from their torture and begged them to torture him, and to kill him instead of killing me. The victim’s mother also gave her testimony:” We live in the area where the Brotherhood were demonstrating in Al-Nahda square. I saw many people who were dragged in the Brotherhood Square, tortured and got slaughtered and thrown in the trash boxes. I was so scared even to leave my apartment and go and make any official statements against them or even to call the Police, because I was scared that my family become a target for the brotherhood. We live very close from the square and we were eye witnessing many massacres which were happening in the square. But I just couldn’t do anything about it. I’m an old woman and I was so scared. We were all scared. Their Sit-In and their Militias in our area were forbidden us from moving freely In and Out our buildings. The mother also showed the spots in their building and shops, were they show bullets holes in their walls, every day they were getting terrorized by Brotherhood and their supporters by practicing this random shooting at anyone and anything in the area.” The Mother added in her testimony. An old Woman in the neighborhood also gave her testimony. She said: “The brotherhood and their supporters killed my son on the 30th of June 2013. My son was a poor young man and he was working as a half truck driver. That’s my son’s truck see how many bullets holes in there? They killed my son in a cafeteria near Al-Nahda square, because he was watching the 30th of June 2013 of Revolution on the TV. People who eye witnessed the Brotherhood’s crime against my son, they informed me that they eye witnessed the whole crime, but they didn’t know where the Brotherhood have taken my son after they shot him. I went like crazy looking for my son, didn’t know whether he was still alive or dead, I ran to hospitals, police stations and at the end I found my son in the Autopsy room! I was able to recognize my son’s body only from an old wound in his hands. I could n’t recognize his face or his body. He had a shot in his head and his face was totally smashed and his body was dark black and blue color and the autopsy report showed that he got brutally tortured by burns caused by electrification. They shot my son in the head then they tortured him after they killed him. I can imagine what happened to my son, because I’ve seen this before. in the building close to us, I saw some brotherhood members and leaders and those, I recognized them because they were responsible in charge of our local municipality. That day they were coming attacking and terrorizing us with their supporters as usual. One of our neighbors went down and told them to stop what they were doing to the whole neighborhood, he told them this is not Islam, this is not how good Muslim are.